Solar Blinds are sometimes referred to as sunscreens and are a beautiful and functional alternative to standard window coverings. They offer added benefits that make them the perfect choice for homes with a view or windows located where sunlight shines directly in. Not only do solar shades offer a clean sophisticated look, they are also eco-friendly. Solar Blinds are made of fabric woven tight enough to block out some sunlight but are open enough to see through. They come in a range of openness from 0-25%. The smaller the number the less open and the less you will be able to see through the shade. The higher the number the more open so the better the view and more light will pass through. Standard window treatments completely block your view when they are closed. 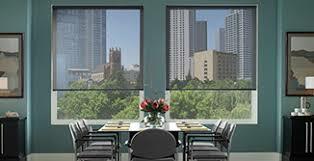 Solar shades allow you to take advantage of the view outside your window even when they are fully extended. 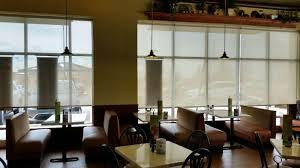 Solar Blinds are a type of roller shade with a fabric panel that wraps around a roller at the top when open. 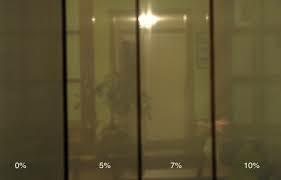 Keep in mind that because of the openness factor, visibility from outside of the home is as clear as it is from the inside, especially at night with inside lighting. If privacy is a concern, choose the lowest openness percentage. Pair solar shades with drapery or curtains to maximize privacy. Solar Blinds are versatile, functional and they look great. These energy-efficient shades look beautiful in any room, while simultaneously saving money on your electric bill and making a more comfortable environment in those spaces that receive direct sunlight. They are different from the other types of window treatments because they are designed to block out UV rays. They block out heat and harmful sunlight to help you save money on your energy bills and keep your house cool in the summer. They also protect your furniture and carpets from fading in the sun. Solar blinds also reduce glare so they work great in rooms with reflective surfaces like TV screens and picture frames, so you don’t have to worry about being blinded by sun beam reflections. No more squinting while trying to watch TV or work on your computer. Contact DC Shutters for Solar Blinds in Brampton, Toronto, Oshawa, Whitby, Oakville, Kitchener, Waterloo, Hamilton, Niagara, Toronto, Richmond Hill, Aurora, Newmarket, Ajax ON.